Quick, quick! | "blackberry-eating in late September"
So I’m behind again. I have been cooking, I just haven’t been posting. It’s funny, the cooking part feels necessary and timely because hey, it’s dinner! But the posting part – if I’m typing something these days, it had better be either my dissertation or a PowerPoint slideshow for the class I’m teaching. If it’s something else, Puritan guilt sets in. But I have so much to share that I had to start working through the backlog. Cook couscous in water with a pinch of salt according to package directions. If you have vegetable broth or chicken broth, use that. 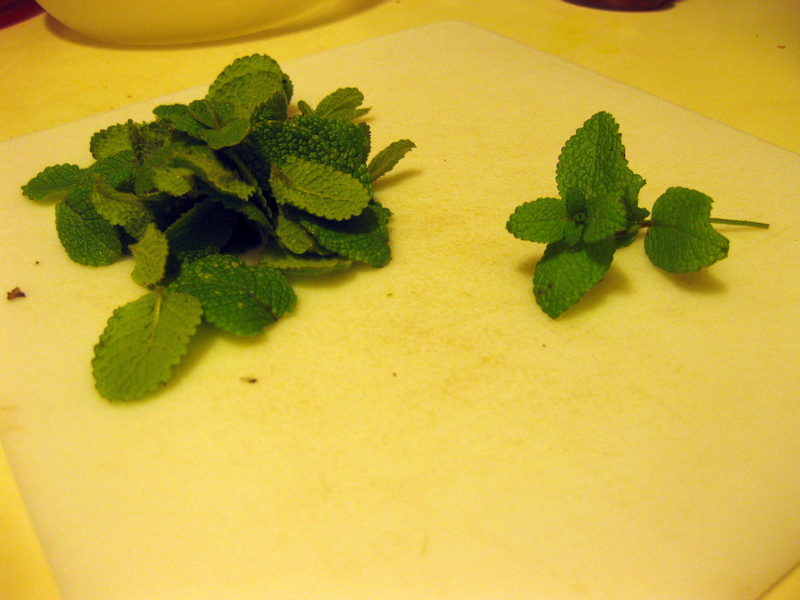 While the couscous cooks, chop the mint, melt the butter in a small skillet and add the pine nuts. Sizzle over medium-low until the pine nuts are barely browned. 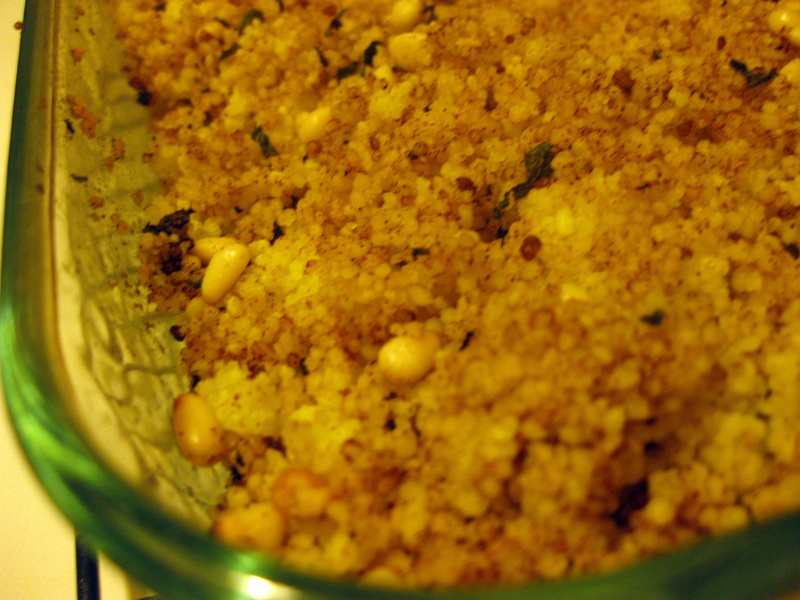 When the couscous is done, fluff it with a fork, toss in remaining ingredients, and stir together. Transfer to your oiled baking dish and bake for 25-30 minutes, or until the top is just crunchy and golden. 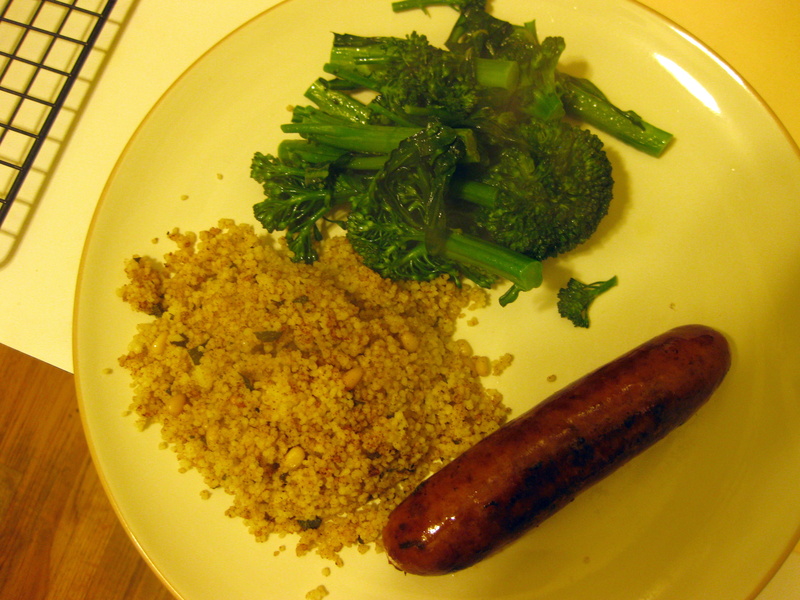 We had this with smoked apple and chardonnay chicken sausages and some steamed broccolini and it was tasty, but not stellar. The pine nuts were roasty and delicious, and the cinnamon added a nice flavor twist, but it seemed to be missing something. 1.) This would be better as a stuffing than as a side; I’m thinking stuffed pork chops or turkey. 2.) It would be an awesome base for a tagine of chicken or lamb. 3.) Dried fruit mixed into the couscous blend would add a sweetness for the cinnamon to play with. I did only one of these things to the leftovers, and it made a definite improvement. Diced dried apricots rounded out the flavors nicely and made it seem almost like a pilaf. Chopped dried figs, dates, or currants would also be delightful. I have so much more to tell you. Cross your fingers I can make it through enough of my academic work to check in again next week! This entry was posted in Baking, fruit, Grains, leftovers, Nuts, Recipes, vegetarian by Chelsea. Bookmark the permalink.